Chocolate Upside-Down Cake - Get the Good Stuff! This has become my family’s favorite indulgence cake, not least because it comes out of the oven already frosted! Yep, it’s a true upside-down cake. It makes a 9-inch single layer cake, perfect for a small gathering. Preheat oven to 350˚F, and generously butter a 9-inch contour (rounded at the bottom edge) cake pan. The secret to the chocolate upside-down cake is in that pan – and, of course, what you put into it, and in what order. Place the cream, jam, and chocolate in a 3-cup bowl or measuring cup. Microwave at 70% power for 2 min 30 seconds, until cream is hot. Whisk until smooth. (NOTE: of course you could do all this in a saucepan over low heat if you prefer.) Pour frosting into the buttered cake pan. First, measure 1/2 cup boiling water into a 2-cup measuring cup, and whisk in the cocoa powder until smooth. Add the milk, vanilla extract, and jam; whisk again. Set aside. Sift together the flour, baking soda and salt, and set the dry ingredients aside. Using an electric mixer, beat the butter and both sugars together until light and fluffy. Add eggs, one at a time, beating well after each one. Add the dry ingredients alternately with the cocoa mixture, beginning and ending with the flour mix. Beat well after each addition. Pour the batter evenly over the frosting, and bake in the center of the oven 45-50 minutes, until a tester inserted into the cake comes out clean. The frosting on the bottom will still be liquid. Cool the cake in its pan on a rack at least 30 min. NOTE: the cake may be made one day ahead of time, cooled completely and left in its pan, covered, at room temperature. To unmold: reheat the cake, uncovered, at 350˚ about 10 minutes. When the cake has cooled, but the pan is still a little bit warm, unmold the cake. 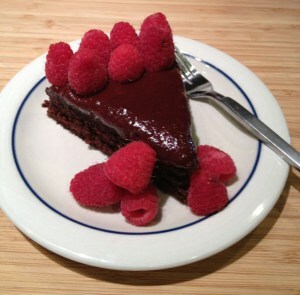 Run a thin knife around the edge of the pan, and twist pan gently back and forth on a flat surface to loosen the cake. Invert a plate with a slight lip over the pan, and flip the cake onto the plate. The frosting will cover the cake and run onto the plate. If a bit clings to the pan, just use a spatula and patch the top: no one will care, I promise. It will still taste fabulous. You’ll want a 9-inch rounded bottom (contour) cake pan for this cake – check your local baking supply store, or see this one at Amazon.